With 2-valve manifolds, the block-and-bleed version is standard. 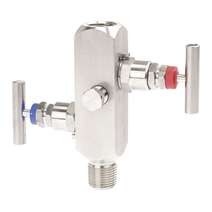 The shut-off valve of the separates the process from measuring instruments such as pressure gauges, switches or transmitters. By closing this valve the instrument can be safely dismounted for services like recalibration or replacement. 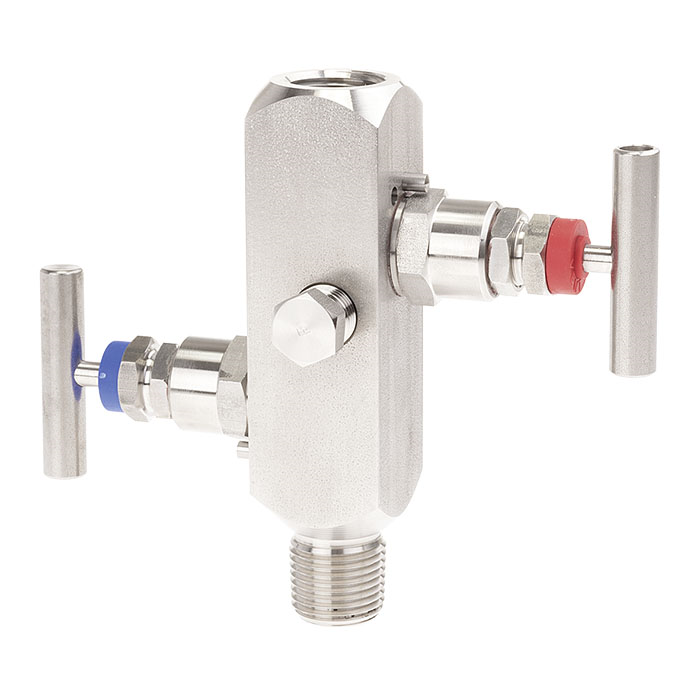 The vent valve allows the safe venting of the instrument, prior to the dismounting or for zero point check. Through the non-rotating spindle tip of the block-and-bleed valve, the wear of the sealing elements is reduced. This results, particularly with frequent opening and closing, in a noticeable increase in the service life. Through the blow-out proof design of the block-and-bleed valve, working safety is improved, especially in applications with high pressure loading. As an option, WIKA offers the professional assembly of valves and pressure measuring instruments and also other accessories into a ready-to-install solution, also known as a hook-up. To ensure the performance of the complete system, an additional leak test is carried out on the hook-up. What is the function of a three-way valve block? What is the function of a single-valve block? What is the function of a four or five-way valve block?